Hand-wrapped in Sakura (Japanese Cherry) bark with traditional techniques and designs from the Akita Region of Northern Japan. The production process is carefully handled not to damage the Sakura tree. Your Sakura Tea Tin Canister will age beautifully and naturally over time. The bottom is also covered in Sakura bark, and is not embossed with our company logo. 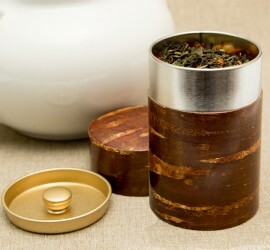 Every Sakura Tea Tin Canister has unique patterns as each canister is crafted using natural tree bark. Canisters made entirely of cherry bark expand and contract depending on temperature and humidity. However, our Sakura Tea Tin Canisters are lined with tin, which not only prevents the tea canister from expanding and contracting keeping the canister airtight, but also makes it a more affordable option compared to tea canisters made entirely of cherry bark.